If you were looking forward to owning a smartphone running at 1.5GHz at the beginning of next year, we've got bad news for you. 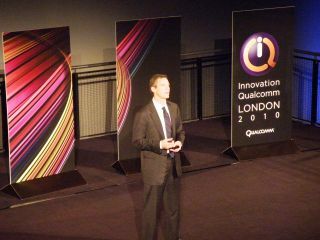 CEO and Chairman of Qualcomm Paul Jacobs stated that the new chip would appear in devices in Q1 2011, but that's been corrected to the end of the 2011, according to the PR team. Apparently he meant the 1.2GHz dual-core chips will be coming then, which makes much more sense as they've been sent out to manufacturers to begin popping them into handsets. The 1.5GHz chip is likely to land in the laps of the phone brands at the tail end of this year, at which point they can begin a series of tests and trials to see what can be done with the chip. We assume this will be carried out with some kind of Rocky-esque montage. Qualcomm's share prices benefitted from the news of the impending chip, so we're assuming someone down the chain will be getting a slap on the wrists for giving misinformation. Of course, dual core chips aren't to be sniffed at either, and given we'll be seeing them by MWC next year, we could see smartphones moving onto even cooler applications soon.